Take a few minutes to invite your friends to like our page on Facebook and we'll send you some great Vote Libraries art! At EveryLibrary, we are always excited to show off the great things that libraries do across the country and get more Americans engaged in supporting libraries. For our 5th Anniversary as a 501c4 for libraries, we want to be able to reach even more Americans with a pro-library message and let our nation's leaders know that millions of Americans love their libraries. That’s why we’re campaigning to find One Million Americans For Libraries and if you take this simple action to support this cause then we'll send you some free art in the mail! Whenever someone invites their friends, family, and colleagues to like the EveryLibrary page, we see huge spikes in the number of people who say they want to support libraries. In fact, the image here is from the kick-off to this initiative and you can see that there are nearly 50 times the usual likes that came from dozens of people inviting their friends to like our page. Imagine if everyone who likes our page invited their friends to like it too? It would only take a day or two to reach out goal! We're doing this because we want to show our Nation's leaders and politicians that Americans love their libraries. You probably got to our page because you've seen how our library institutions are being closed, attacked, and defunded and we want to be able to quickly and easily reach millions of Americans just like you whenever our libraries are threatened so we can ask them to take action by signing petitions, attending rallies, or making donations. This is an opportunity to drastically change the landscape for libraries in the United States. 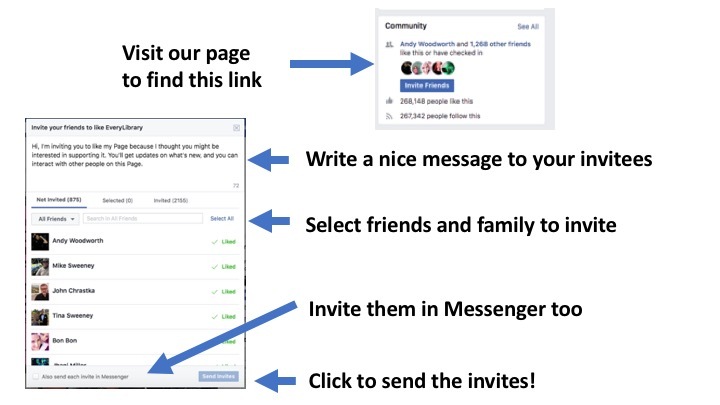 So please, help us find One Million Americans for Libraries by using the “invite” feature on Facebook. It takes 2 minutes to ask your friends and family to like the EveryLibrary page. I know it doesn’t seem like much, but with everyone taking this step, we’ll be able to reach our goal of One Million Americans for Libraries in an exceptionally short amount of time. If you invite your friends to like our Facebook page and let us know here, we'll send you some great vote libraries art in the mail for free. Again, if you take this critical step, we’d love for you to let us know by signing up on this page. If you do, I’ll send you some amazing Vote Libraries art in the mail. Thanks so much for your help and support! P.S. If you are really interested in taking the next step, we’d love to see you show the world that you are one of millions of Americans who love libraries by adding a badge to your Facebook profile picture. These badges were designed by our fantastic intern and she'd love to see these badges everywhere too. I did invite my friends on Facebook. I spent my Saturday mornings at the library when I was a kid. We have a great library here where I live and the people use it and support it. Love the work you’re doing! You will not be inundated with emails or insignificant posts, but you will show support for your community! Did you invite your friends?